I have read, over and over, and over and over how people should use a Blue Yeti microphone. This is typically done by “Experts” who haven't recorded episode one, and have opted to “Google best podcasting microphone” and the Blue Yeti would often come up (based on other people who also failed to do any research). So for years I've listened to a few podcast done by people who I know use a Blue Yeti. Instead of having this intimate “I'm in you head” sound, these podcasters sounded like they were recording in a small closet. Not a BOOMY noise (like a bathroom) but enough of a “room noise” to sometimes be distracting. Now there is one very keen point. I listen through the ears of a podcaster and we don't listen like normal people. I've heard some podcasts like Podcast 411, and they sound fine, and I've heard other where they didn't. So what was the deal? With all the focus on “fake news” this week, I decided to take one for the team fork over the $90 and get one myself. It's a little thing I call “integrity” that every podcaster starts with, and 12 years later I believe I still have mine (although I am sounding a bit like the Church lady right now – almost ready to bust into a superior dance). The Yeti has four different settings. The one you want is the “Cardoid” pattern. This means it only picks up from the front of the microphone. The sad truth is with spending all this money, if you somehow want to record two people with two yeti's it's not not that easy as the Yeti (not the Yeti Pro) is usb ONLY. This also means that any kind of processing (compression, noise gate, etc) will be HAVE to be done in software. Unless you want to purchase the Yeti Pro (which has the ability to plug into a mixer) which costs $199. This is why the Audio Technica ATR2100 is the Best Podcasting Microphone NOT the Blue yeti. While the stand that comes with the ATR2100 is very simple, it will pick up less thumping (but I would still recommend a shock mount. This unit is a shock mount and pop filter in one for $9. Because its more of a “traditional” microphone you are a little more open to pop filters and shock mounts. The ATR2100 works via USB and XLR ( can work with a mixer) so if you're flying solo, or need to plug into a mixer you're good to go. 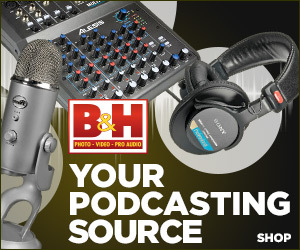 So to get the same features you would need a Blue Yeti ($199), Pop Filter ($22), Shock Mount ($30), so would be out $251. Where is the ATR2100 is $77, the pop filter shock mount is $9, so you would be out around $86.